Our new partner Trivitron, India based medical technology giant! NewsOur new partner Trivitron, India based medical technology giant! 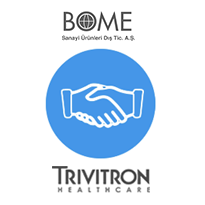 Trivitron Healthcare, with over 1,500 employees worldwide and 8 functional factories in India and Europe, has acquired 60% of Bome. Our company has achieved to be one of the leading companies in Turkish health field with its strong R & D team and production facility which is strictly adhered to international standards. We had many grounbreaking achievements with the products we locally developed which are widely used in our country. We reckon that we will take our national achievement even further with the partnership we have established.